Designed for high output activities in cold temperatures and moderate weather, the Argus Jacket is insulated with breathable, hydrophobic Polartec Alpha synthetic insulation. 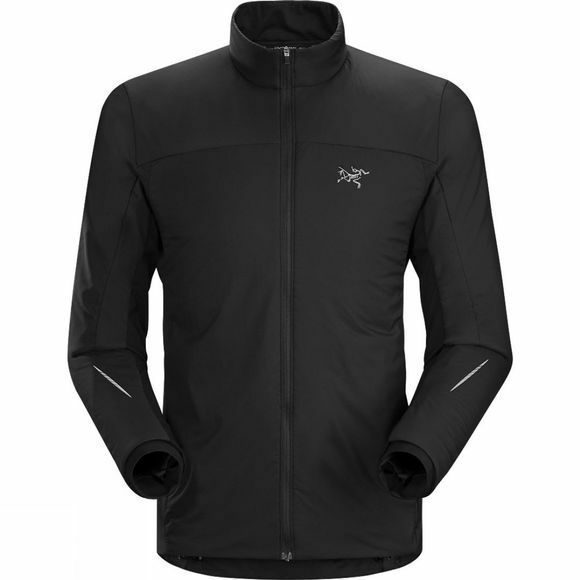 Placed at the front and shoulders to offset direct exposure to wind and cold, this lightweight insulation provides warmth with minimal bulk. Lumin nylon face fabric sheds wind and light precipitation, while the highly breathable, moisture wicking Torrent back panel facilitates ventilation and freedom of movement. Two easily accessible rear stash pockets hold gloves, hat or energy foods. An adjustable drawcord at the hem seals out cold, retractable thumbholes hold sleeves in place, and reflective blades on the back and sleeves improve visibility in low light conditions. Serious mountain training means confronting a variety of conditions, including cold, wind, rain and snow. Prior to Polartec Alpha, the lack of breathable insulation meant choosing between overheating or foregoing necessary protection. Polartec Alpha, a unique synthetic insulation combining exceptional breathability and lightweight warmth, has specific properties that allowed Arc'teryx to create outerwear uniquely suited for high output in cold weather. The insulation's knit construction is more stable and durable than traditional synthetics. This stability permits the use of air permeable open weave face fabrics that encourage air flow through the garment to help increase evaporation and moisture transport. The result is essential warmth without overheating. The knowledge Arc'teryx has acquired from creating for harsh alpine environments goes into the design and construction of products that help athletes focus on maximum personal performance. The Argus combines minimalist design with technical intelligence in a piece that combines breathability, insulation, weather protection and ergonomic freedom.